Ashinaga provides educational and emotional support for orphaned students worldwide through the Ashinaga Bereaved Undergraduate Scholarships . Our programs enable these students to overcome emotional trauma, advance in their education, and become agents of social change. 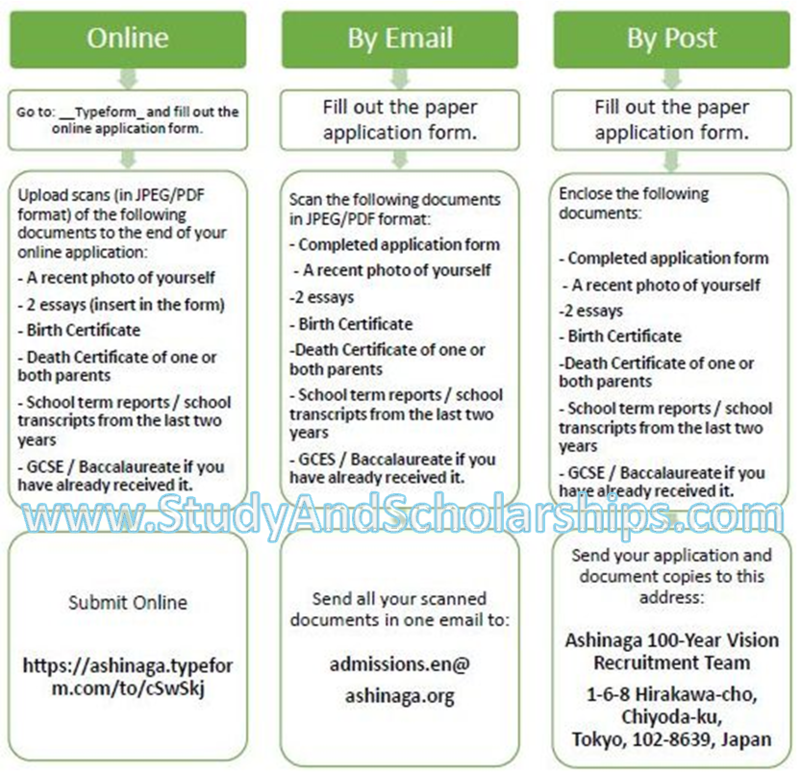 Ashinaga is offering The 100 Year-Vision scholarship program for bereaved or orphan students from Africa to undertake undergraduate degree studies at world renowned universities in countries like Japan, USA, UK etc. Since 2014, the 100 Year-Vision scholarship has provided talented orphaned students from sub-Saharan African countries with the opportunity to apply for and to potentially pursue a higher education (for the level of undergraduate degree) at the world’s leading universities outside Africa. Each year, the 100 Year-Vision project will select one academically gifted bereaved student from each eligible African country who do not have the opportunity to study at a university in their own home country and provide him or her with a full scholarship to study abroad. Have completed 12 years of education (primary and secondary school) within the last two years, or those who will complete 12 years of education by December 31 of application year. Vocational certificates not accepted. Students are chosen on the basis that they want to return to their countries in order to develop the industry in their chosen field of study, hopefully with positive social impact. This award provides a FULL scholarship that covers the cost of tuition, accommodation (during the terms and vacation), insurance, flight, and provides monthly stipend which covers food and necessary academic costs. There is no application fee. Do not pay any money to anybody. Students are required to complete an application and submit copies of all academic and identity documents. There are three ways to apply for the 100-Year Vision Scholarship – Online (preferred option), By Email or By Post. Please choose one method and submit all the correct documents before the deadline. See the image below to guide you. All documents must be submitted in English, French, or Portuguese. If it is not one of these three languages, candidates must have the documents translated. See the 2017 announcement. It is important to read through this guideline(pdf) and also visit the official website (link to it is below) for complete information on how to apply. Applications are currently closed for this scholarship. Ashinaga is a Non-Profit Organisation based in Japan that support bereaved students educationally, emotionally and financially, ranging from infancy right up to the completion of higher education. The organisation has supported young people in Japan for around 50 years but expanded to start helping students internationally in 1999 after the natural disasters in Turkey, Colombia and Taiwan. The 100-Year Vision program has the goal to nurture future leaders in Africa by providing full scholarships to orphaned students to study abroad, whom it is hoped will contribute to development of their own countries upon their return, not long after completion of their study program abroad. 2018 Innovation Prize for Africa for African Entrepreneurs. Greetings,I am Mrs valeria dasha. an aging widow suffering from long time illness. i am currently admitted in a private hospital here in Abidjan cote d’ Ivory, I have some funds I inherited from my late loving husband Mr.Nathaniel dasha. The amount of US $7.500, 000.00 which he deposited in one of the Bank Here and I need a honest and God fearing person who have the feelings of human that can use this funds for God’s work and 30% out of the total funds will be for your compasation for doing this work of God. Please if you would be able to use these funds for the Lord’s work kindly reply to me .